For over 20 years, the John Fried® brand has been helping to define style, worldwide. Synonymous with international runways, film sets, red carpets and everywhere where style sits, it's also forever linked with sleek, shiny transformational styling. The newest addition to the brand is the launch of the John Frieda® range of professional stying tools, including the premium Salon Shine Hair Dryer. With its metallic matt finish and high gloss chrome accents, this Salon Shine Hair Dryer delivers on style and literally brims with features and advanced technologies including its ground-breaking Advanced Ionic Technology. 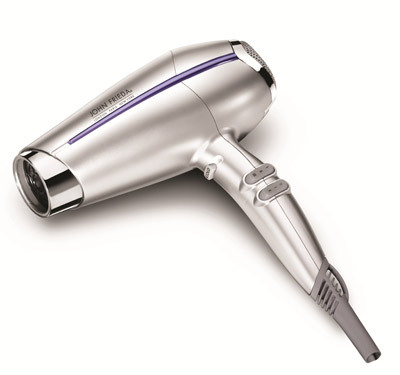 This technology includes a High V Ion Generator which produces 50-80% more ionic output than any other dryer on the market including professional ones and works by releasing a stream of ions to surround and condition each strand of hair, neutralising static and in turn smoothing the outer layer of the hair cuticle to control the frizz factor! A lightweight professional AC motor. A very durable titanium-ceramic casing (advantage: it's heat resistant allowing it to withstand higher heat than aluminum or other metals). An ultra slim concentrator nozzle for controlled styling. Three heat settings and two speed settings (with rocker switchers) plus a locking cold shot option. Runway Take: John Frieda® styling tools have been designed to translate very now, very on-trend hair directions into every-day reality. With minimalism and natural beauty retaking the runway at the Spring 12 shows, hairstylists channeled easy elegance and delicate shine. Indeed shine was everywhere and provided the backdrop for a bevy of interpretative looks from classic American glamour to bouncy ponys and big blowouts. It was all great and it all shone very brightly!